Last week I wrote about a new feature in Canon’s EOS 80D, where you can specify a timezone by its UTC offset rather than only being able to choose from a predefined list of timezones (which is decidedly useful when you’re in one of the unusual zones around the globe). As I suspected, this feature has also appeared in the EOS 1D X Mark II. While relatively few people are going to be excited by this because they can’t see a big, heavy, and expensive 1D X Mark II in their future, it does show that Canon seems to have embraced this feature as more than just an experiment. Unfortunately the “Time Difference” feature is not available in the EOS 1300D (at the opposite end of the EOS camera range) which was announced last week. This is disappointing (it would have cemented this as part of the Canon standard) but I’m not especially surprised. The 1300D seems to just be an incremental update to the 1200D and wouldn’t have had the same engineering effort applied to its firmware as the 80D or 1D X Mark II. I’m still hopeful that other new models will gain the Time Difference feature (and that other manufacturers will follow suit). It’s only a tiny feature but especially in some travel situations makes life just that bit simpler. Already almost every EOS model introduced from 2012 onwards supports timezones and the GP-E2 GPS (including the 1200D, but with the sole exception of the cut-down M10 mirrorless camera which doesn’t even have a flash hot-shoe). 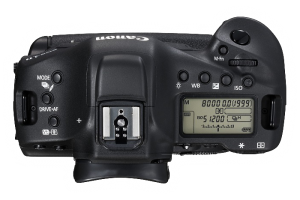 The AF is still fundamentally similar to the 1D X, 5D Mark III, and 5Ds/5DsR, but has increased sensitivity and has the Large Zone AF mode introduced in the 7D Mark II. It should be a simple transition for anyone used to those cameras. When recording a GPS trail, previous cameras with internal GPSes (EOS 6D, EOS 7D Mark II) will keep the GPS active and logging even when the camera is turned off. While this can be useful, it will continue to consume battery power. The 1D X Mark II adds another choice: to have the GPS powered off while the camera is turned off (although not if the camera has auto-slept). I suspect this will suit a lot of people who otherwise forget to turn the GPS on before starting a shoot. Overall I think the 1D X Mark II builds on the features of the 1D X and the other recent cameras, and is a very impressive piece of technology. But at least even the people who aren’t going to use it are likely to see some of these features filter down to more-accessible models in the future.